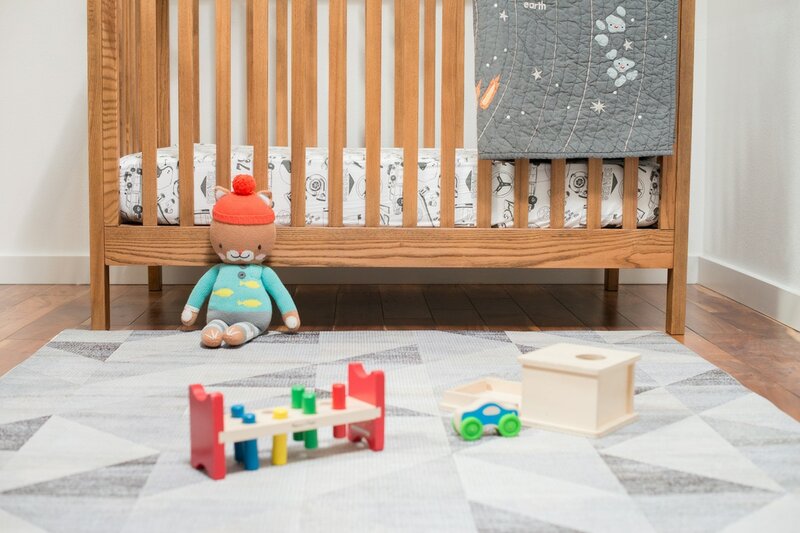 Meet Ruggish Play Rug … a comfortable, high-end memory foam play mat that protects your baby without sacrificing your style! 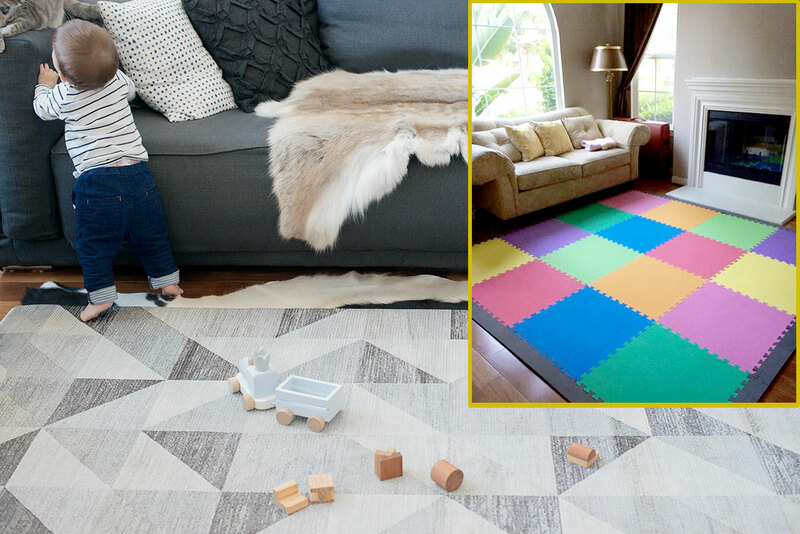 I’m searching online for a play mat for my baby and my monitor is covered with endless choices of brightly colored tileable mats that would not go with any one’s decor. Unfortunately, I have no options and I click “buy”. Fast forward to a week later, my living room now has a brightly colored alphabet mat taking over the space and worse bit is that it doesn’t even work that well! This is exactly the experience I was thinking of when I read about Ruggish. Where were you 16 months ago? Ruggish is a great option for those parents that want to keep style and function in their home. It’s multifunctional! 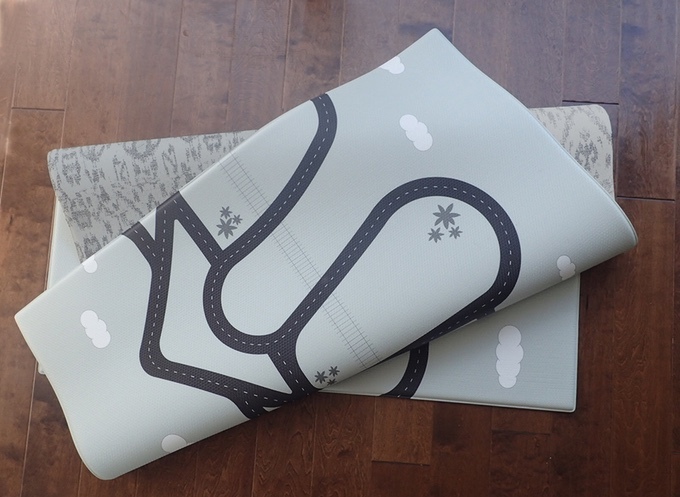 One side of the mat is stylish and modern – that fits into everyday (non kid) home decor. Flip the mat over and you have a kid friendly, well designed graphic roadway for your kids to play. Parents are happy, kids are happy = KIDKATAT is happy! Durable, waterproof and easy to wipe clean! No more need to stress if kids (or adults!) drop things on the ground. It’s not only a playmat for your kids. 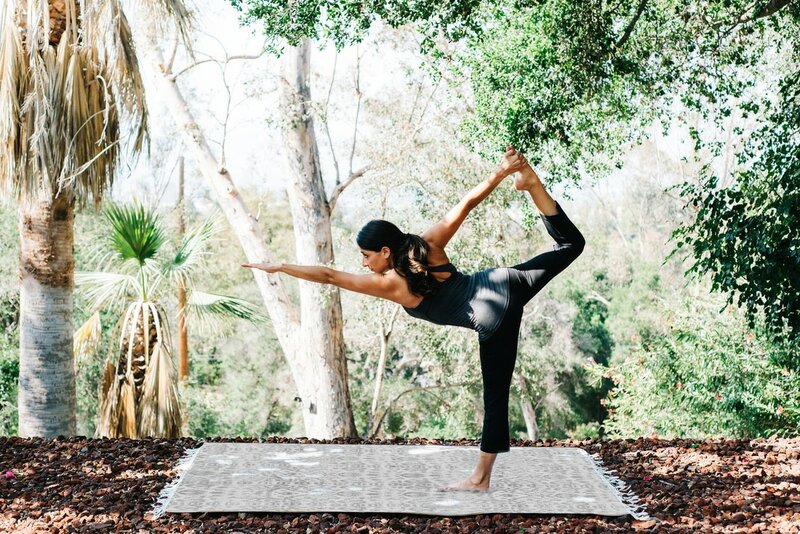 Ruggish can double as your athletic/yoga mat as well! Less Stuff, More fun! KIDKATAT had the pleasure of talking directly to Liza Savary, the mastermind behind Ruggish. Read on to learn more about Rugish and how you can get one of your very own! KidKATAT interviews Liza Savary from Ruggish. What inspired you to create Ruggish? When my first son was born, we were living in Santa Monica in a very small apartment. His nursery was also our play area, Office and Guest Room. When he started to crawl, we quickly realized that we needed to replace the trendy cowhide rug with something more protective, and comfortable for us, as we often joined him to play on the floor. 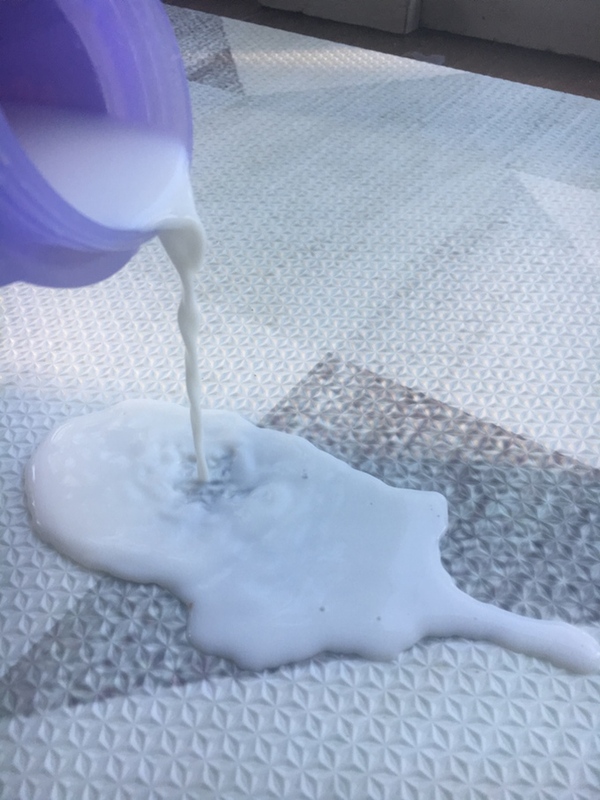 The only options that existed were colorful, foam tiles that have traditionally been considered to be the best protection when it comes to baby play mats; but in reality, they don’t actually offer cushion, they are easy to pull apart by little ones, and the cracks collect crumbs, dirt, and liquid. Other one-piece play mats were designed with letters, numbers and colorful characters that in no way complemented our décor. As a solution, I created the Ruggish Play Rug, a product that offers the comfort and protection of a play mat, and the look of a designer rug! I am lucky to have a huge network of creative and supportive family and friends who always offer design help and constructive critiquing. My husband is an Architect and an amazing support and sounding board. He has always understood my vision and I definitely wouldn’t be here without him! Our two boys are 1.5 and 3.5. They are great product testers, models, and they offer design suggestions. My older son once pointed out that the train track on the map was wider than it should be, and he was right! He said, “Mommy, can you please fix it?”. It was a proud mommy moment! What were you doing prior to creating Ruggish? I studied Architecture in College and have my Masters in Interior Design from Pratt Institute. My husband and I moved to LA from New Jersey with plans to stay and explore for a few years. That was 11 years ago, and we seem to be pretty settled! In addition to Ruggish, I am an Interior Designer, focusing on residential renovations and corporate interiors. I love how Ruggish is two sided (top side being formal and the bottom side playful) What gave you that idea? Kids love train tables and interactive play mats, but they are usually covered in bright colors and characters. 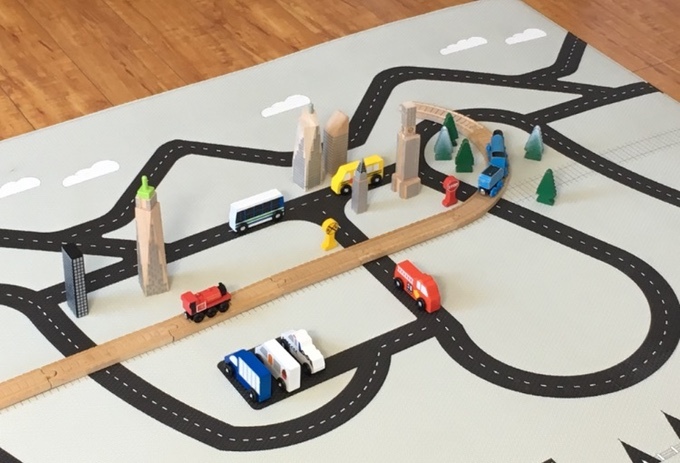 Having a double-sided product means it’s a designer rug, high-end play mat and train table, all in one! The modern map is designed to blend into your space, and can easily be flipped over to the rug side. Is ruggish meant to be used instead of a rug or to be placed on top of an existing rug? 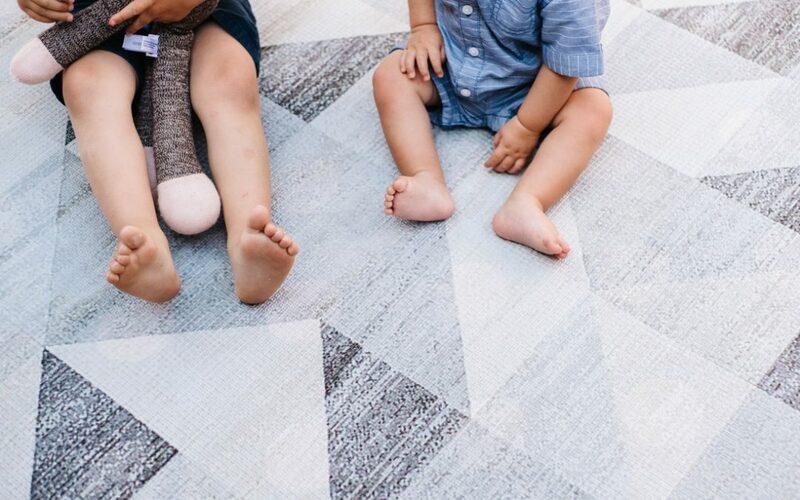 Ruggish Play Rugs can replace your area rug in any space and provide protection on hard wood floors, tile, or even outdoor spaces. It also can lay flat over carpet to protect from spills. What has been your favorite part of working with Ruggish? I have spent years researching and creating prototypes and I have learned so much about the process. The first prototype is still used in our home daily and has always been our favorite baby product, we are so excited to finally make it available for others! 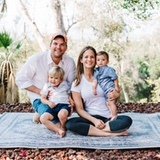 I have also loved connecting with other entrepreneurs and parents that believe in our product. One of the best emails I have received was from a mother letting me know that her special needs child will benefit greatly from the product, and it will look beautiful in her home. Knowing that this product is stylishly improving lives is truly a dream come true! Our product is not only designed to look beautiful in your home, but it is durable, waterproof, and one solid piece, which avoids the collection of crumbs, dirt and liquid that happens with standard foam tiles. The unique layer of memory foam protects kids and makes the Ruggish Play Rug most comfortable product of it’s kind. It’s easy to roll up and relocate, and is a great place to work out, or take a rest! Why have you decided to launch Ruggish on Kickstarter? Our first order minimum is very high, so in order to begin production, we need to provide a large amount of capital up front. I love that Kickstarter is such a powerful marketing tool and allows us to spread the word by getting people excited about the product! Surprisingly, approximately 20% of our pledges has been directly referred by Kickstarter. We have discovered new projects ourselves and love the cross promotional support that happens within the community! We look forward to expanding our patterns and sizes! We are live on Kickstarter until April 20 at 8:00 AM! How can you get a Ruggish play rug? Miss the Kickstarter? Go to: http://www.ruggishco.com/ for more information. Only a few days left to be one of the first to have the most stylish play rug on the market at 20% off!